Updates: Typhoon Chedeng (Maysak) intensifies and now a super typhoon that aim to hit Philippines this April 4, 2015. US and Japan rate Maysak as Category 5 which as at least 260kph of wind. On Tuesday, typhoon Chedeng strengthened which made it a Super Typhoon. LGUs preparing all its units for bracing they typhoon. 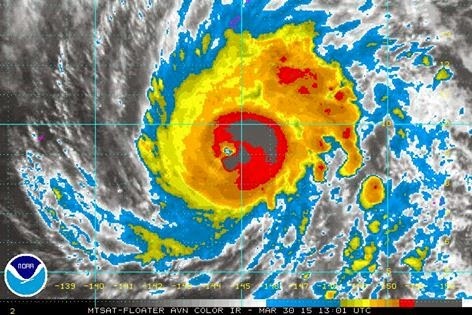 The strong typhoon Chedeng may landfall in Luzon this April 4, 2015. Meteorologists warned that a storm reported to have left several casualties in Micronesia was building into a super typhoon as it swept across the central Pacific and headed towards the Yap group of islands.